Today I was at home using my phone and my mom and my brother’s went out of the house with out telling me because I was to busy using my phone. I was watching youtube then I heard the door shut Frist I jumped of my bed with a fright I looked out my window and saw my mom my brothers going in the car and driving off then I saw someone with a mask I quickly went under my bed but I forgot to lock the door. As the door slammed I knew she was in my house I heard climbing up the stairs the mask person opened my door and revealed her face it was…. My mum!!! Hi Ai-Amin. Thank you for taking the time to post on the 100 Word Challenge this week. What a twist to your story – it was very clever and really unexpected. I wonder why everyone left, or whether it was a plan to get you off your phone?! The part I enjoyed most was when you saw everyone drive off but the masked person suddenly appeared. To make your writing even better, next time make sure you don’t slip in any details about your secret character. You did warn the reader by saying the masked person was a she – you could try using ‘they’ instead to keep your reader in suspense for a little bit longer. Well done! 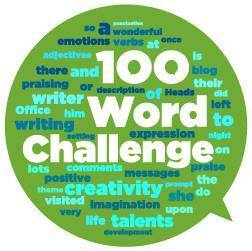 I look forward to reading your next 100 word challenge. This is a funny story. I guess it just goes to show how easily we get distracted by our phones and our ipads that we don’t see what’s going on around us. I wasn’t expecting the ‘mask person’ to be your mum! What a brilliant story! This is a really good piece of horror writing, especially around Halloween time. But what really makes it great is the twist you put on it making it a comedy too. I can relate to this as I have experienced a similar feeling. I went to the London Tombs, a horror attraction in the city. It was really scary, they had professional actors and everything, which made it feel so real. But at the same time, it was fake, so I could appreciate how funny it was. You make really good use of grammar and punctuation, especially the ellipsis and the exclamation marks. It is really effective. I also really like how you end the piece with your mum pulling off her mask, as it really captures the mother and child relationship. Keep up the good work!